I normally don’t go to movie theatres. Most movies I catch now a days are DVDs, Blue Rays, or XFinity at my house or at showings my friends host. Occasionally though, I will go on a whim and see a film in theatres. My parents are on Cape and we had a free night. So my dad pitched the idea to see a film on Friday night. We all agreed. We ate quickly and drove over to the theatre in Dennis. We forgot it was opening night of the new Spider Man movie, so we had to wait in line for a while. Fortunately, once we got our tickets, we walked into one of the best films I’ve ever seen in person. I’m not exaggerating, Baby Driver is one of the absolute best expereinces I’ve ever had at a movie theatre. Why’s that? Well I shall explain. The rest of the technicals of the film are excellent too. The cinematography is outstanding, especially with all the motion. The film never stays still, whether the criminals are discussing a heist, in the middle of crime, if Baby is out and about, or if the lead couple is on a date. The film doesn’t stay still, even when it’s slowing down from the violence of the crime world. I guess I’ll talk about that part now, don’t see this movie if you’re squeamish. There is a ton of violence. Not as much as The Revenant, but it is still not for the faint of heart. There are high pressure scenarios, shockingly violent deaths, fierce gun battles, and plenty of blood and explosions to go around. However, it’s not grituitous. Everything feels earned and nothing feels out of place. Which brings me to the action and car chase scenes, they are outstanding. The chases are beautifully captured and flow seamlessly. The action is remarkable. It does feel a little much, but everything else is so grounded and feels so real that the action can be as thrilling as the director can make it. The car chases are beautiful to watch, and in my opinion, top the chases in any Fast and Furious movie. Baby Driver‘s chances aren’t as elaborate, but they are more real because you care more about the characters in the cars, at least about Baby, than any Furious film. Now on the writing and story, I’ve rarely been as compelled in a film. The premise of a talented get-away driver who’s musically inclined and has a painful past trying to live a regular existence but getting pulled back into the crime world of Atlanta, and thus endangering his loved ones is an interesting premise and it works beautifully well. The film constantly twists and turns and always gives you new things to think about and doesn’t let you rest. The actors are perfectly cast for their roles. Andes Elgort is perfect as Baby and carries the film. He’s charming, lovable, and a fun character to watch. Jon Hamm and Elsa Gonzalez are outstanding as a robbing duo and dirty couple. They bring some edge to the film. Jaime Foxx is magnificent. He has no regard for anyone but himself, is scarily trigger happy, and is the film’s psychotic wild card. Kevin Spacey is manipulative, controlling, and completely captivating. Basically, he’s Kevin Spacey and is his character from House of Cards. You’ll love watching him. Lily James is striking and charming, working beautifully well as the love interest and the lighter side of a crime movie. But the character who stole every scene for me was CJ Jones’s character, who never says a word yet completely steals the whole show. Watch the film and you’ll see what I mean. Lastly, Edgar Wright deserves incredible praise as the writer and director of the film. This has been a premise he’s wanted to work on since 1994. He turned the planned opening of the film into a music video for Mint Royale’s “Blue Song”. He kept it on the back burner until the time was right and finally got the chance to make it a reality. My only concern is that he’s been in discussion for a sequel and I think it’d work well as a stand alone. I hope there’s no unnecessary sequel. 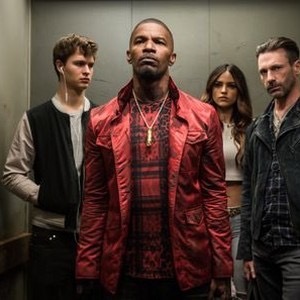 Baby Driver manages to work as a crime thriller with romantic elements. It juggles a few different genres and works so well. It is one of the absolute best films I’ve ever watched in a theatre. If you have a free night and can stomach some brutal violence, do whatever you can to go see this movie. It is worth every single penny paid to see it. Well, this is fitting. The first time I tried to make this little project happen, I got as far as the first post and got derailed by other things. Now, let’s get the project started by revisiting the only field I touched on in 2015. 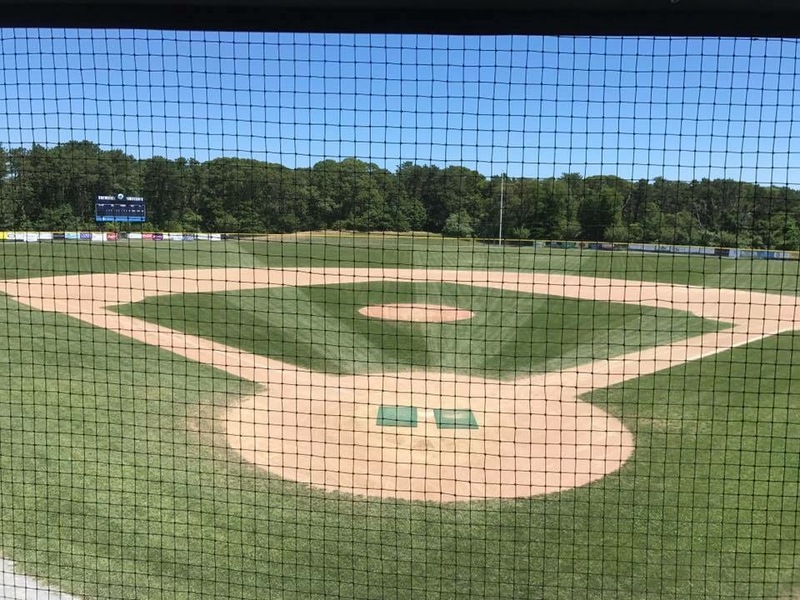 This is my look at Stony Brook Field, the home of the Brewster Whitecaps. Now a few points before I get into the actual review. I love the Whitecaps organization. They gave me a chance to be a writer. That chance started me on the career I have today. They’ve allowed me to meet amazing athletes, fun fans, and among the best people I’ve ever encountered. I love the memories I have made at this field. They are among the best I ever have in sports. That being said, I will keep my blissful memories out of a critical analysis of the field’s merits and flaws. A little spoiler, most of the review will be praise, but I am not blind to possible improvements. Let’s get started! Brewster has a bigger year-round population than Orleans or Chatham, but it doesn’t have a real “downtown” or business area. So there isn’t a truly central place to put the field. They put it at Stony Brook Elementary School, which works well enough. The school is on Underpass Road, between the two major roads in Brewster, 6A and 137. It’s signed well on both roads, so the location works. It’s right on the Cape Cod Rail Trail, so bikers can come by and see the crowds and come on in. There’s also a few bike shops, a pizza place, a mini golf course, a fish place, and a popular taco place right next door, so there’s plenty of stuff right around the field. There’s also plenty of parking around the field, including overflow parking at Eddy Elementary, just a short walk through the woods away. The only location point I’m taking off is a general issue with Brewster: it’s way too spread out and doesn’t have a central business area the way other towns do. The only other issue is that it’s in a residential area and the locals don’t want lights on late, so there are no lights at Stony Brook. Those slight issues aside, the location works well and I quite like it. Brewster has incredibly varied seating. There are traditional metal bleachers up the first and third baselines that get you up close to the field. You’re behind a fence, but you kinda have to be for safety. Foul balls can be hit hard. There are also a few hills you can bring chairs to sit on. The biggest one is over the first baseline and makes for a great chance at foul balls. There’s also a smaller hill on the third baseline, but you have to get there EARLY to grab a spot there. Lastly, there’s a hill in center field that overlooks the whole field. It’s a cool place, but there are two issues. First, it could be mowed down a bit. There are too many weeds and it’s quite messy. Don’t sit there without a blanket or a chair. Second, it is far from the action. That’s an issue with any baseball game, but it feels more away from the game in Brewster than at other fields I’ve been to. 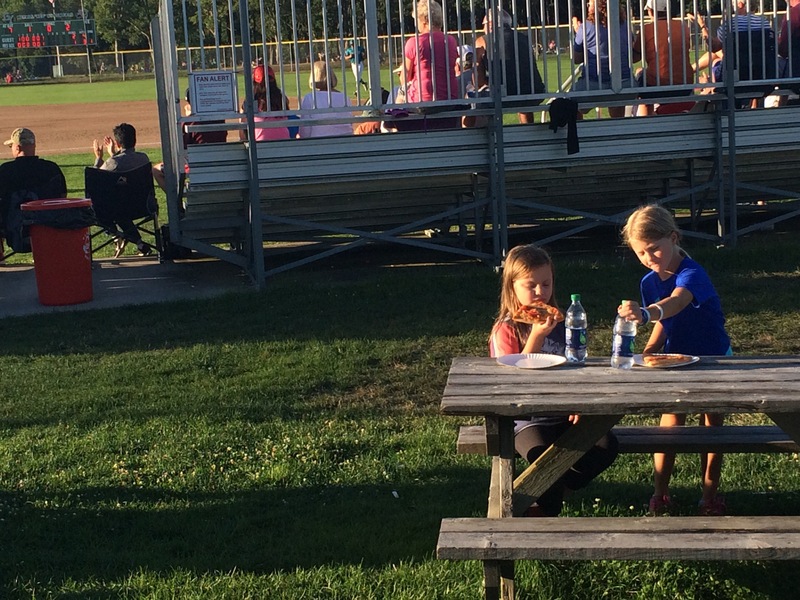 In addition to all that, there are picnic tables down the first baseline that provide a different feel completely. Unless you have food with you or have a young family, I wouldn’t recommend sitting there. It doesn’t give the best viewing angle if the game. Stony Brook has remarkable variety in style of seats and viewing perspectives. It can give you two completely different perspectives of the same game. The only point off is split between the listed issues for center field and the picnic tables. Otherwise, the seats are excellent. For many years, the Whitecaps had the assistance of the Brewster Skippers, a jump rope team that did fundraising by selling the food at Whitecaps games. They had a trailer along the third base line that they operated out of. It was unique, and the food was excellent. Last year was the last for the skippers, as they had a hard time getting a crew together for it, and the food set up is now different. Now the food is done by volunteers from the Nauset Regional Schools. They have a tent set up right next to the school, on the hill overlooking the 1st base side. It’s the same set up as Orleans and, spoiling that review a little, it works nicely over there. The new set up is quite good. It’s a ticket set up for grilled items. The selection is rather elementary but they do everything well and get it to you in a timely fashion while being courteous. Only points off are for the location being away from the souvenir trailer and the rather simple selection. Otherwise, it’s pretty good. This is a pretty field. The layout allows for some breathtaking sunsets over the third base side, the scoreboard is the best and most complete in the league, and the lack of lights takes nothing away from how pretty a field this is. Especially with Ryan Smith as the best creating patterns in the field pregame. No problems at all here. This is an excellent baseball atmosphere. 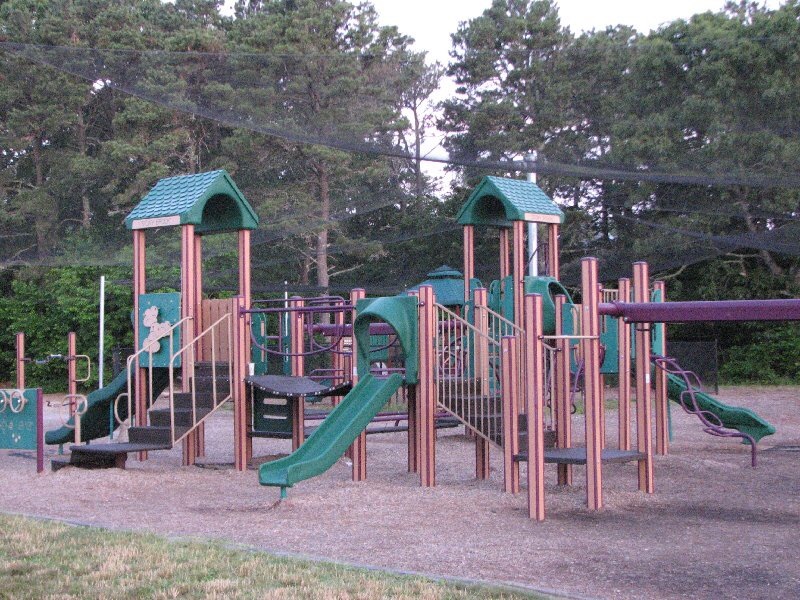 The public address announcer is the best in the league, The fans are excellent, and the playground behind the press box is outstanding for the kids. The only point off is for small things, like how the lineup posting is a piece of paper in a bulitin board on the back of the press box instead of a larger and more asthetically pleasing form like a whiteboard or chalkboard or how there’s no speed gun showing how hard the pitcher is dealing. Otherwise, it’s outstanding. This is an excellent ballpark. 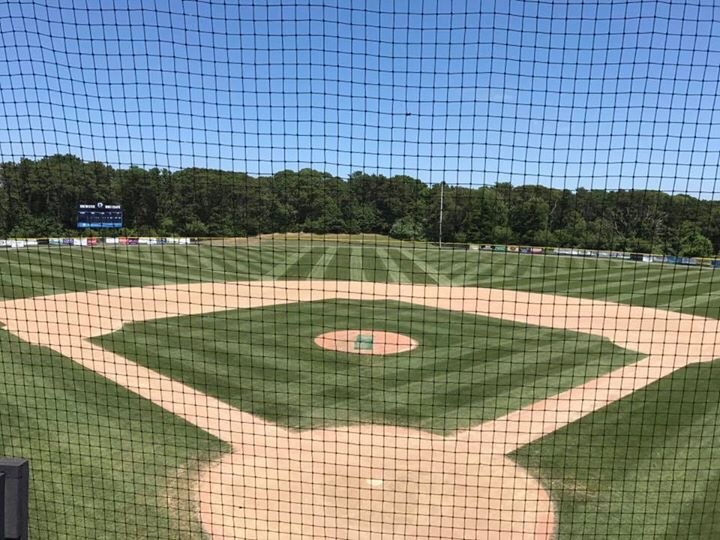 It does everything well and is a must see for anyone privy to the Cape League. 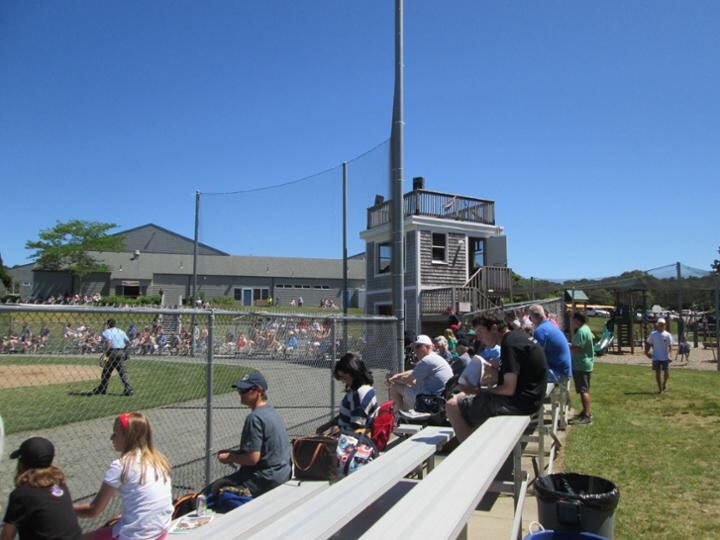 Brewster is not a summertime destination in the same way Orleans or Chatham are, but people staying at Ocean Edge or in the area are doing themselves a gross disservice not going to a Whitecaps game. Go to Stony Brook and take the kids. They will love the playground and stay for the great baseball too. 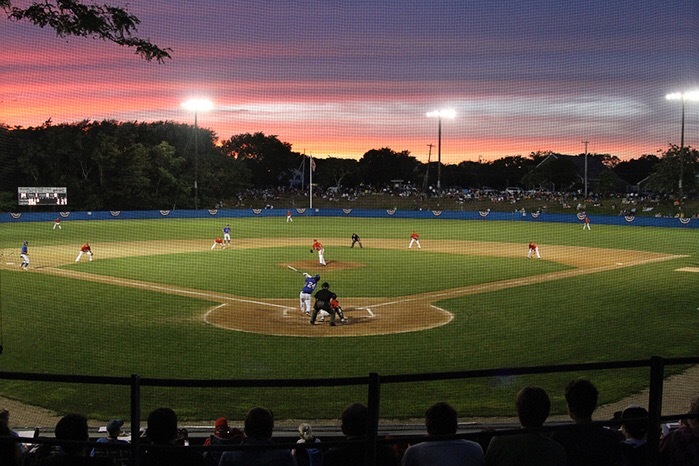 Since buying our house in Brewster in 2000, the Cape Cod Baseball League has been a regular part of our summertime merriment. 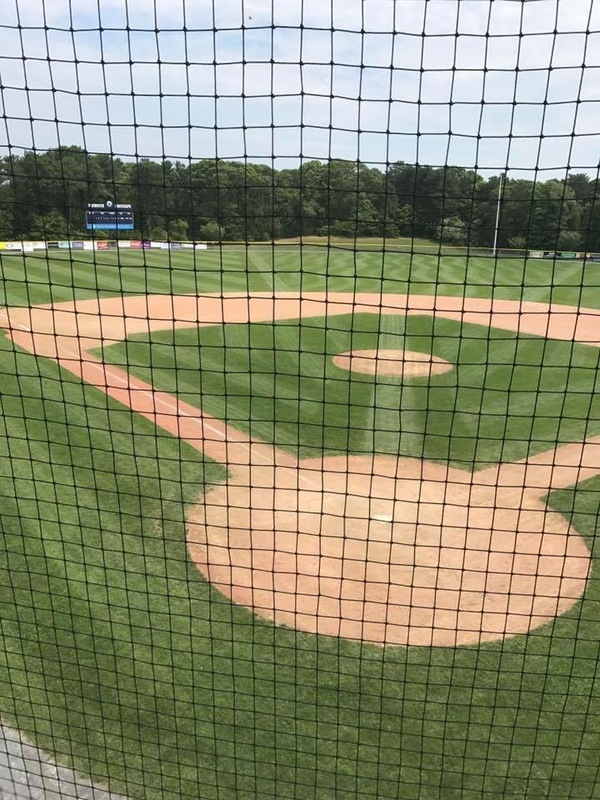 We’ve followed the Brewster Whitecaps through many summers, tough games, and two different home fields. I’ve been to every single field in the league and I’ve formed many memories. I’ve also gotten to work in and around the league. In 2012, I interned for the Whitecaps as a gameday ops intern, taking donations at the gate, selling 50/50 raffle tickets, setting up the stands and cleaning them up post game, hanging banners and advertisements in the outfield, and promoting the team and players wherever I could. Three years later, I rejoined the Caps as the team’s writer and social media intern. The year after, I had a hybrid internship that had me splitting time as a game day ops guy and a writer. This year, I’m working for Lower Cape TV as a cameraman and production guy broadcasting Whitecaps games. So I’m back on Cape and working around the league and the Whitecaps again. 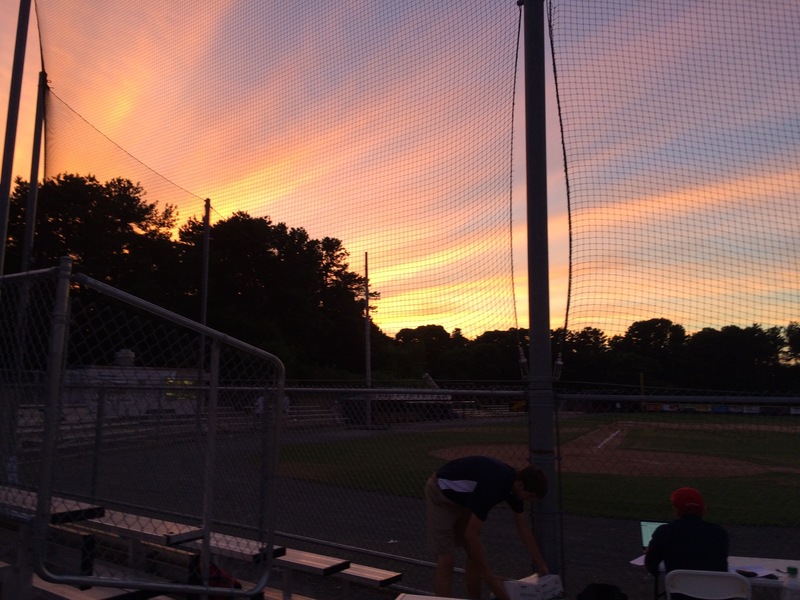 I also started writing reviews of Cape League ballparks. I’ve kept myself plenty busy in recent summers. About that last thing though, I never actually finished the review project. I did a review of my home park in Brewster and never did more. What happened? Simple: I got distracted by other stuff. I was writing for the Whitecaps and had enough on my plate at the time. This summer, I’m finally gonna get that done. I’m gonna review every ballpark in the Cape League. 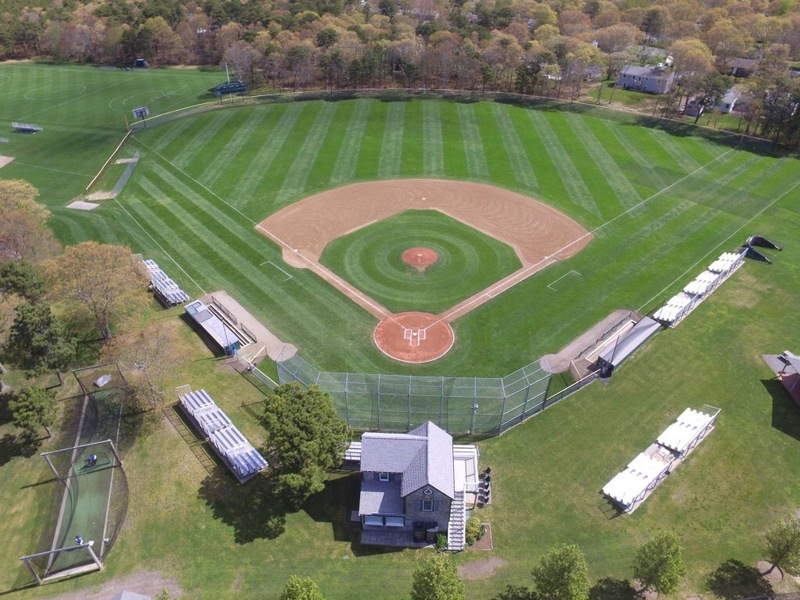 That includes redoing my look at Stony Brook Field in Brewster. I’ll be judging the field based on location, seating, food, aesthetics, and general atmosphere, each on a scale of 10 points. I’ll just lay out my favorite ballparks as they are now. And I am excluding Brewster from this initial ordering. I’m a little biased in their favor. I’ll reevaluate all my opinions on these fields as the summer goes on. I’m quite curious to see how the fields matchup. Here’s to baseball! Film animation is not in the best of places. Dreamworks has fallen in prestige and quality. Studio Ghibli has been on hiatus since 2014. Even Pixar is making confusing choices in production, with Cars 3 and Toy Story 4 in the works. It feels as though modern animation is stuck in place, showing cute animals, fart jokes, and silly gag humor instead of developed characters and compelling stories that are simple enough for kids to get and compelling enough to keep the adults in the theatre watching. Perhaps the poster child for the state of animation today is Illumination Entertainment, a subsidiary of Universal Studios that has risen to fame with Despicable Me 1 and 2, Hop, The Lorax, and Minions. The studio is probably most famous for giving us the adorable yellow minions. They’re fine, but they got a standalone film to milk their popularity and their humor is everything that has gotten old in comedy for me, especially animated comedy. When my mom expressed an interest in going to see Illumination’s newest film, Sing, I thought it would be a harmless film with some good moments sprinkled in. When I realized who made it, especially with the mixed critical response to both this film and the recent Secret Life of Pets, I got a bit nervous. When the previews rolled and I saw the horror of The Emoji Movie roll, I face palmed so hard, fearful of the film to follow. Fortunately, Sing is actually pretty good. It does have its fair share of fart jokes, puns, and gag humor, and the notion of a singing concept is a little overdone with American Idol, The Voice, and many other similar shows existing in real life. However, I wasn’t cringing for the film. In fact, I quite enjoyed it. It’s a fun movie with impressive animation, a compelling set up, characters I enjoy and root for, excellent music, and voice acting that is absolutely perfect. Matthew McConaughey has a phenomenal voice and puts it to good use as Buster Moon, a koala working as a show producer who owns an old theatre that has fallen into financial difficulty. Seth MacFarlane brings cockiness and irresistible charm with his speaking voice and his lineup of crooner songs, namely Sinatra hits, and is a huge highlight. Jennifer Hudson as a shy but talented elephant is excellent and Scarlett Johannsen as Ash, a rocking porcupine with an underappreciative boyfriend are so much fun to watch. My favorite character in the movie is Johnny, a gorilla with a cockney accent voiced by Taron Egerton. His arc is possibly the most dramatic and, for me at least, the most satisfying. He is a charming prescience that you can’t root against if you have a heart and relates well with the teenage and young adult crowd looking for their own direction and acceptance from their parents. It’s a brilliant casting choice, as are the rest of the characters. There was depth, development, and a full arc for each of the important characters. It had the depth that many animated films seem to lack in today’s age. I’m not sure why so many critics have decided to be harsh toward this movie. David Ehrlich of Indiewire gave it a 16 out of 100 in his review of the film, claiming ‘”Sing” is the Platonic ideal of an Illumination movie. It’s a profoundly soulless piece of work that shines a light on the mediocrity they foist upon the children of the world.’ I’m not sure what film we both apwatched, but I didn’t see a soulless production. I saw an entertaining movie with good music, imaginative sequences, namely with the squids, and excellent moral lessons to take away for kids from 1 to 102. It’s not the best movie I’ve seen all year, but I would be lying if I said it was anything less than a fun, lighthearted musical comedy with phenomenal voice acting. If you have kids and want them to start liking musicals, this is a fine way to introduce them to it. I just hope that Illumination makes more of this and less of the Minions moving forward. Animation needs more heart and character and Sing gives us those in spades. For my entire time in in high school, I was an active member of my school’s dramateurs. I did 13 shows in my time at Northwest Catholic and loved it. After my school time ended, I did tech for some shows my freshman year at BU. I enjoyed it, but other complications kept me from doing anymore BU shows and I missed being on stage. I joined my town’s summer theatre troupe in 2013 and returned in 2014, doing Guys and Dolls and On The Town respectively. When my last performance of On The Town began, I got the sense that this would be the last time I’d be in a show, at least for a long time. I wasn’t gonna do anymore BU theatre and I would have to jump into the professional world after college, leaving no time for the intricate and demanding schedule of a full musical. I was content with that being my last show and had one of the best runs of any show I ever did. It was a great way to end my time on the stage. It stayed that way for two years, and then this summer happened. Early this month, on the last day of the Whitecaps season, my coworker at JoMamma’s approached me with an interesting proposition. He is the lead in a production of Grease, over at the Acadamy Playhouse in Orleans, the town next to Brewster. I had seen the show with my mom earlier in their run and liked it. So how would I like to be in it? Well apparently someone was going to unexpectedly leave the show and the company needed someone to fill in for him to have a last week of shows. With my season over, and with some time before my job can start up, I decided to take him up on his offer. I’m back on the stage in Grease. And I only had 10 days to learn the whole part, which has been quite a challenge. I now appreciate so much more about theatre after being away from it for a couple years. Most importantly, I now understand the necessity of the rehearsal process. Seriously, the opportunity to practice a show with no audience watching is a marvelous thing. A bond needs to be developed between the actors, crew, and director in order to produce a great product. I’ve only had 10 days to learn the lines, music, choreography, blocking, and get my costume together. It is a rush to get everything together, and I understand why the rehearsal process is now completely required. Thankfully, im not taking over for a major role, so I can pick up everything in the time I have. Coming back to theatre after two years is a remarkable experiece. It is also quite jarring after hanging out with baseball players all summer. There is a very different dynamic between ball players and theatre people. It’s not a bad thing, I’m just not used to it. I’m adjusted back to it now and I remember why I love theatre. The creative process of figuring out how to make a character respond, working with other actors, understanding the music, getting the dance steps correct, and getting the applause of the audience for a job well done are wonderful. There aren’t many times you can work with a talented group of people, entertain people, and have a grand time doing it. I’ve had a marvelous time doing all the things listed above. Well I’ve done everything except the applause part. I have my first performance tomorrow night and I’m performing in Grease until next week Saturday. If you wanna come see it, I’d love it! So would the whole cast and crew. They’ve been working so hard on the show and they invited me to go along for the ride. I’ve loved it so far and I’m excited for the chance to perform tomorrow night. Check the website below if you want to see. Hopefully I break a leg! So I haven’t written on here in a while. Why? Well I’ve been busy with my two jobs and I’ve not had a ton of time to write here. One of the jobs is at a bagel shop called JoMamma’s. It’s an upbeat place with a good crowd of people to work with. It’s an easy job, as I’m on my feet all the time, but it has been rewarding and a ton of fun. The other job is closer to what I wanna do for my career. I went back to intern for another summer with the Brewster Whitecaps and became the Everyman of the unit in a way. I prepped the field before the games, picked up the trash after the games, sold 50/50 tickets, drove myself to most away games, served as the backup writer, and live tweeted games whenever I needed. I had a more varied job set compared to last summer, and I enjoyed it quite a bit. And there was one more role I had with the team that was more important than the others I had. I hosted a player for the summer. 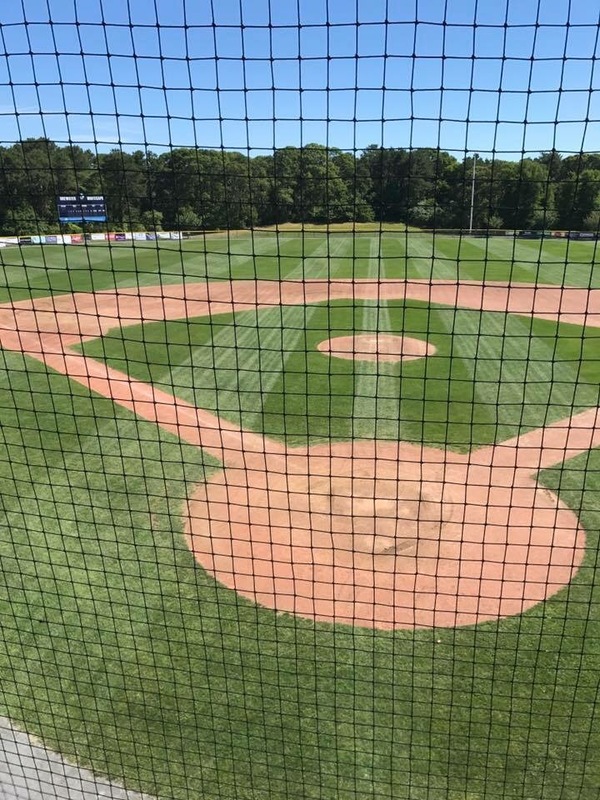 The teams of the Cape League don’t put their players up in hotels or houses for the summer out of their own pockets, they likely wouldn’t be able to afford it. To make the season happen, the teams recruit locals to host the players for the summer. Yes, this means smelly baseball players who chew tobacco take over people’s houses for weeks on end. But it is completely worth having another person living in the house, or so I have heard many times over before the summer began. We learned about our player in late May, and he arrived early the next month. His name was Zach and all we learned was that he was a corner infielder from Asheville, North Carolina, and attended the University of North Carolina. It seemed promising at the outset. When Zach and his college roommate Logan arrived at the start of the season, it turned into the best summer possible. Addicted to cellphones and social media. Loves Chipotle and other fast food places. Car troubles dictate life choices. Trash talking among friends is expected, especially when those friends go to rival schools. And there’s more where these came from. But there’s also some important differences. They all boil down to one major difference: Zach and I are from different worlds. Collegiate athletes have their schedules rigidly scheduled down to the tiniest letter of the day by their program. They have workouts all throughout the days and required study halls and classes and then they have regular people time to socialize and meet people. Their lives are so much more scheduled than my college life was, and it is almost completely dictated by one thing: their sport of choice. It’s even more intense than just their day to day lives being structured. They have a serious chance to play this sport as a career and to do that is a whole thing in and of itself. They got to speak with and play in front of scouts from all over the country, and their stock at next year’s MLB draft was both positively improved this summer. They both will be drafted and play professional baseball. That is their main focus, ahead of their schoolwork. It’s striking to see people so focused on that one thing, especially seeing how physically demanding it is. Zach and Logan got beat up badly during the summer. Fouling balls off their feet and shins, diving all over the field, hard runs to track down baseballs, crashing into fences and teammates, and getting hit by 90+ mph fastballs are only a few things that the guys had to deal with. They frequently had to take baths with Epsom salts, wrap themselves in ice, and get in good health right before the next day. Their dedication was admirable and inspiring. All I could do was get them the support they needed and let them know that they had a man in their corner. Despite those massive differences, the ultimate lesson I found in all this was that they’re not actually that different from me. They’re talented baseball players and potential major leaguers, but they’re still regular guys who play Call of Duty, talk sports with the guys, watch Netflix, and talk about their dreams. They’re excellent guys, perfect gentlemen, and the opposite of every dumb jock stereotype devised. I rooted for the Whitecaps more fervently than I had before, but more specifically for the guys who were living with me. There was more tension when they batted and more concern when they limped after fouling a ball off their shin. There was also more satisfaction when they got a hit, made a defensive play, or scored a run. They were and still are brothers, not just friends. My mom felt like she had two more sons and was nervous an I’ve ever seen her at a sporting event. We loved hosting them and were sad when they had to leave! Logan left early after a he reaggrivated a hand injury. His coach wanted him to avoid more injury and get treatment back at Chapel Hill. Without his best friend and roomie around, Zach was still excellent to have around. But he had to leave eventually too. A week ago today, the Whitecaps were eliminated from the playoffs and the season ended. 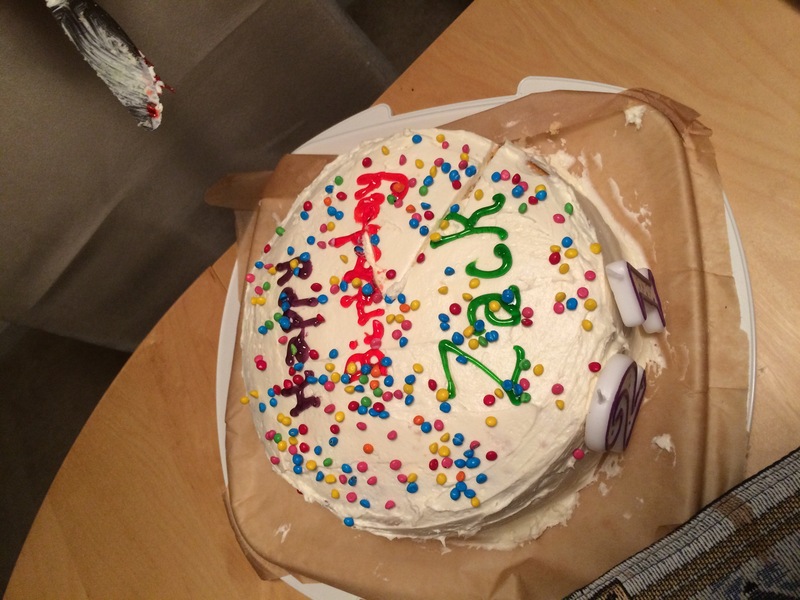 Fittingly, it was also Zach’s 21st birthday. 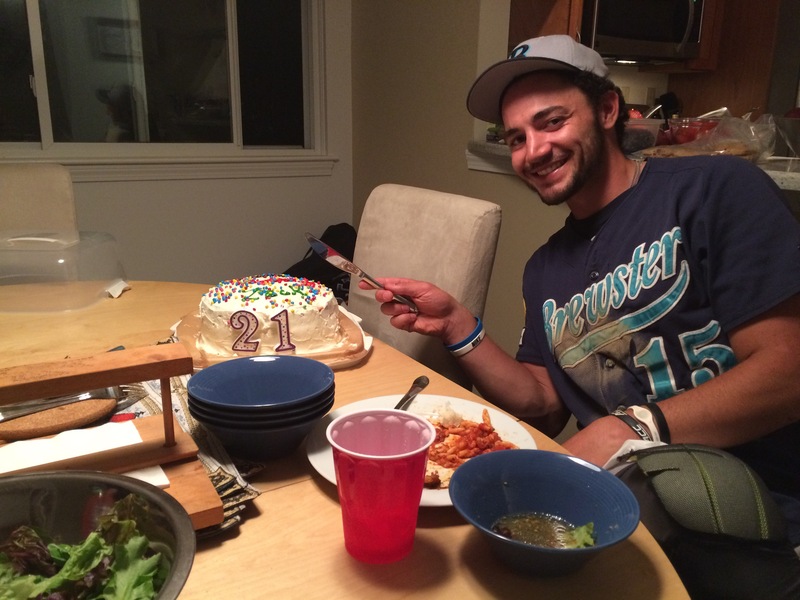 He came home to a big birthday feast, including a proper cake, and we celebrated his fun summer on the Cape. He drove out the next day with another college teammate. It was bittersweet to watch him go home. I knew the summer was gonna end for him, but we wanted the season to go on a bit longer! A week after the season ended, the house is now empty, save for me, and it’s so quiet. I’m expecting Zach to show up any minute and give some quip about the game, the umpires, or say how terribly he played, expecting better of himself the next day. Instead, the house is quiet, except for when my parents are up. It’s jarring being home with no one else here, especially my friends on the team. It’s another example of life being ephemeral, as my high school theatre director, Mrs. Avery, always said. I miss the guys, the games, and the energy of the league. But I appreciate everything I had is summer so much. It’s been a week since the season ended and I have come understand how amazing this summer was. The players were such amazing guests, the games were fun and entertaining, and I have two new friends who just happen to be amazingly talented baseball players at one of the best baseball programs in the nation. I loved every second of it. Zach, Logan, thank you so much for living at my house this summer, I’m happy to have been a part of making your Summer’s possible. You two are always welcome to come to New England! And you have a family of New Englanders who are North Carolina baseball fans. Thank you my friends. I will follow you and support you in your attempts to make your dreams of playing Major League Baseball a reality.